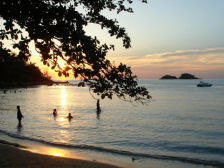 At 250 square km, Samui is the largest island in the Gulf of Thailand. It has an international airport serviced via Bangkok, Krabi, Phuket, Kuala Lumpur and Singapore. There are also several car ferries to the mainland. Over the last 20 years, the main industries of coconut farming and fishing have given way to tourism, and many of the small cheap beach huts favored by backpackers have been replaced by luxury resorts. Happily, local regulations limit the height of these resorts so there are none of the high rise hotels seen in Phuket or Pattaya. The primary resorts of Lamai and Chaweng offer stunning white sand, luxury resorts, spas, water sports, restaurants to suit every pocket. Although famous for its beaches, the interior of Samui has much more to offer. 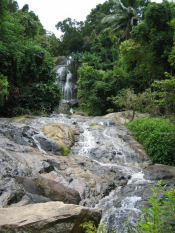 The interior of the island is dominated by rainforest with some beautiful water-falls and mountains with spectacular views. You can explore by boat, foot, motorbike, bicycle, jeep or, for the very adventurous, by elephant. Koh Samui is only a short ferry trip to the diving and snorkelling mecca of Koh Tao, and only a 20 minute ferry trip to the mountainous beauty of Koh Pha Ngan.